Awesome sky! Love the cool color cast. Horizon is perfect and the overall atmosphere is very soothing. Nice capture !! very nice. a very nice serene shot. quite relaxing. Fantastic. I love that shot. Great colors! 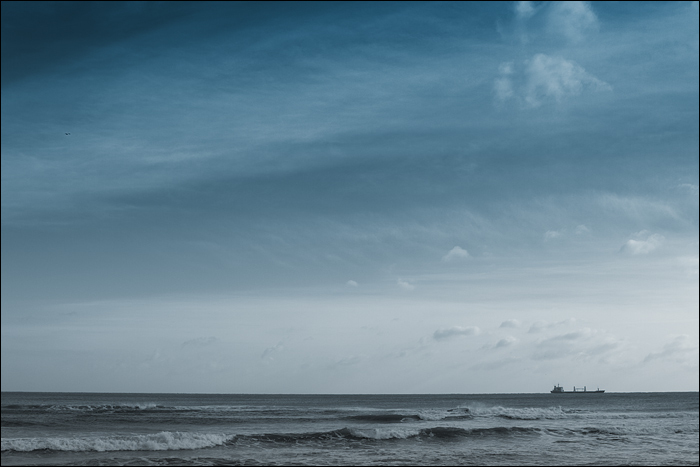 Love the little ship there – adds a bit of subject to the vast sky/sea combo. Perfect title to a wonderful photo. Great! Lovelly color tone and contrast. And the ship realy comes across as the center of the picture, although your eye has to search for it at first. A good thing! The boat really draws your eye and brings the picture together. I’m digging it. Lovely shot. I like the muted blue tones and the feeling of vastness. Such a lonely feeling from this. Incredible shot. great composition, and sense of the detail that add all the value to the picture. so nice. Coolest panorama.I’ll end up the comment with this.Cos I have got to resume viewing it now. Very Zen – cool composition.